Soy is considered healthy and a great alternative to meat products. Soy is made from soybean, and is of 3 forms. They are soy milk, soy fibre and soy protein. Recently it has been shown that soy has some side effects too. Using it for a short time, like six months, is safe. But if you consume it for longer period of time, it can be unsafe. Why does soy protein affect us negatively? Soy protein contains various toxins in it, including phytic acid, hemaglutinin, phytoestrogens and trypsin inhibitors, which are responsible for the side effects you suffer from. However, by using it in limited mounts, you can avoid these side effects. Soy contains high amounts of proteins. It also contains a compound that can prevent the digestion of protein. As a result, we suffer from bloating, constipation and upset of stomach. When soy breaks down in the body, it releases a mucus-like substance, which can form a coating on the inner walls of the gastrointestinal tract. This produces lots of mucus` and slows down the digestive process. All these can lead to acute stomach aches, irritable bowel syndrome or diarrhoea. If you already have an underactive thyroid gland, you may develop hypothyroidism or other autoimmune thyroid diseases by consuming soy products. This is because of the presence of goitrogens and phytoestrogens in soy. According to studies made, soy milk can bring down the levels of iodine in the body. When iodine is deficient in the body, the thyroid gland cannot work efficiently. This can lead to hypothyroidism, insomnia, weight gain, digestive issues and mood swings. Studies made have shown that soy isoflavones have the ability to enhance the number of the epithelial cells present in female breasts. This means that isoflavones in soy can disrupt the functioning of estrogen hormones, thereby increasing the risk of breast cancer by turning the epithelial cells in to cancerous cells. But there are certain studies that contraindicate this negative impact of soy protein. So, to be on the safer side, it is better to limit the amount of soy protein that you consume. If you have a family history of breast cancer, you should avoid this protein. Another study shows that women who consume genetically modified soy protein can have abnormally long menstruation, with heavy bleeding. This is called Heavy menstrual bleeding or ‘Menorrhagia’ in medical terms. Consuming soy protein in excess can increase the risk of bladder cancer. The risk is more if you have a genetic history of bladder cancer. Then it is important that you stay away from soy proteins and soy-infused foods. Many of you take concentrated soy isoflavone supplements to provide your body with the protein required. Using these tablets for long periods of time can lead to endometrial cancer. Pregnant women should always avoid such supplements as they can cause harm to the foetus also. Soy protein contains inhibitors that can affect the activities of trypsin, a digestive enzyme. Trypsin is essential for braking down proteins in the small intestine. It is secreted by the pancreas in the form of trypsinogen. Studies made show that the inhibitors interfere with the functioning of this enzyme and cause damage o the pancreas as a result of it. Soy contains a toxin named hemaglutinin, which can clump red blood corpuscles and create small to big blood clots. It affects the normal flow of blood and obstructs various functions of the body. Soy is a natural source of aluminium. When this enters the body in excess, it can lead to various renal diseases. The oxalate in soy can cause kidney stones. Your digestive system finds it difficult to process these oxalates. As a result, it gets accumulated in the kidneys. When the levels reach extremely high, it gets converted to kidney stones. You should avoid soy protein if you have a history of renal failure or any other renal disorders. Men are also affected by soy protein. Soy protein can reduce libido in men. Two other components in soy protein, daidzein and genistein, can inhibit estrogen. They can cause erectile dysfunction in men. Men who use soy protein can suffer from mood swings, gynecomastia, lower sperm count and excess growth of body and facial hair. Phytic acid or phytates are found in high amounts in soy. This can prevent your body from absorbing minerals that are essential for the body, like calcium, iron, zinc, magnesium and so on. When these minerals are not absorbed by the body, you may suffer from Vitamin D deficiency, fatigue, anaemia, fast breathing, palpitations, rapid heart rate and so on. According to studies made, soy can impact the reproductive system in women. So, if you find it difficult to become pregnant, make sure that you control the consumption of soy. Women who eat genetically modified soy protein are more at a risk of developing retrograde menstruation. Here women experience period cycle halts. This can cause endometriosis, which is one of the primary causes for infertility in women. Soy is rich in ‘biologically active compounds’, such as genistein, daidzein, glycitein etc, which are called ‘isoflavones’. They are estrogen disruptors, and can disrupt our endocrine system. They can boost or decrease the activities of natural estrogens. As a result we suffer from hormonal imbalance. Genetically modified soy protein contains glyphosate, which can affect the endocrine system in women. This hinders the functioning of aromatase, which produces estrogen. Estrogen has an important role in pregnancy. It is produced in high levels during pregnancy. Lower levels of this hormone can be harmful for the foetus and the would-be mother. 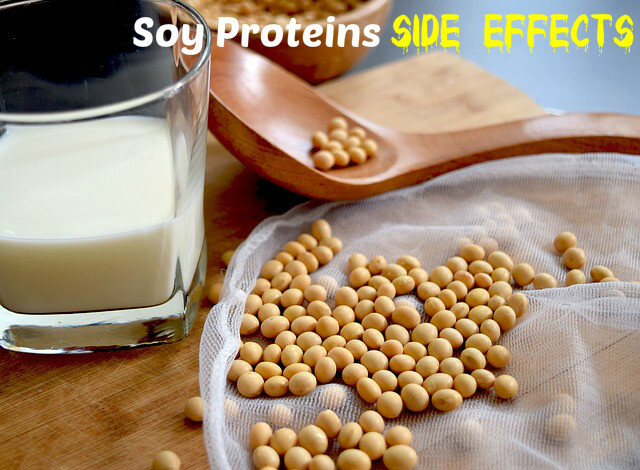 Asthma, gout, skin rashes, itching, skin allergies etc are other side effects of soy protein. So, make sure that you take it in moderate amounts. It is better to consult your doctor before you include soy protein in your daily diet.